Despite centenary commemorations around the world in recent years marking 100 years since the First World War, it appears the British public is largely unaware of the impact of horses in the bloody conflict. While most (80%) respondents to a survey conducted for Brooke Action for Working Horses and donkeys by nfpSynergy, knew that horses were used in the conflict, only 12% knew that between 1914 and 1918, eight million of these animals died on all sides. Mules walked through the streets of Minehead to war. This week Brooke has launched Every Horse Remembered, a new campaign marking 100 years since the end of WW1, to highlight the contribution of working horses and donkeys past and present. One million horses, donkeys and mules from were conscripted in the UK and used in WW1, and only 62,000 returned after the conflict ended. Almost half (48%) of the UK public were surprised to learn that many of those that survived were sold or abandoned. Brooke’s founder Dorothy Brooke later found thousands of Britain’s war horses, walking skeletons labouring on the hot and dusty streets of Cairo. She wrote a letter to the Morning Post (now the Telegraph) appealing for help, and the British people helped her buy back 5000 of the animals. She established the Old War Horse Memorial Hospital in 1934, which later became Brooke. Then and now: Equines are still beasts of burden in the developing world, as they were during WW1. The charity now helps working horses, donkeys and mules around the world. Of those surveyed, very few (14%) realised that there are 100 million equines currently working in the world. These animals help an estimated 600 million poor people to earn a living and provide for their families. UK equestrians did better on the survey which tested respondents knowledge of certain facts, knowing more about how many horses fell in the War (16% of equestrians answered correctly), and how many horses, donkeys and mules are working around the world today (18% answered correctly). Brooke chief executive Petra Ingram said the Every Horse Remembered campaign has been launched to highlight the struggle of working horses, donkeys and mules of the past and present. Eight million equines on both sides died in WW1. John Simpson Kirkpatrick (centre) with his donkey Duffy carrying a wounded soldier at Gallipoli. “We’ve found that even though many people know horses were used in the First World War, there’s little understanding of what happened to them afterwards, and even less realise that these working animals are making a valuable contribution today. Celebrities and well known equestrians have already lent their support for the campaign, including Jennifer Saunders, Clare Balding, Olympic gold medallists Charlotte Dujardin and Victoria Pendleton, Jan Leeming and Wendy Turner-Webster. Deborah Meaden is also supporting and giving a speech for Brooke at the Animals in War remembrance service, organised by Petplan Charitable Trust and Dogs Trust, on November 10. 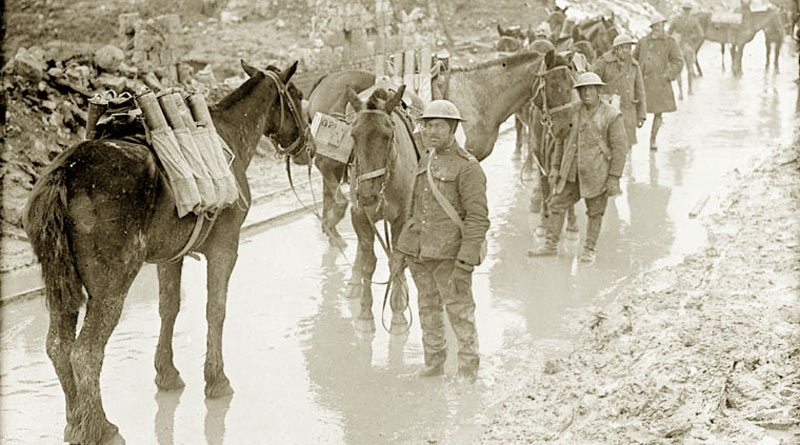 Horses endured treacherous conditions on the battlefields of war. Mules gathered in Minehead before heading to WW1. ← Evolution of the equestrian arts: Are we seeing the light(ness)?